Introduced during event "Courant September" before closing for rehabilitation. 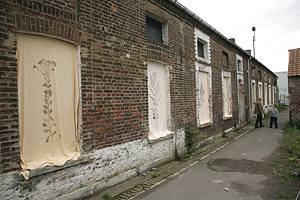 Situation: an ancient miners' terraced houses in the city of Bruay-la-Buissière. Materials: recycled sheets, cordage, horticultural stakes, hardware shop, iron in concrete, thread with sewing, containers, gas burners, vegetables collected, cut, cooked or beaten, garden hoses, water, soap, iron sulphate, alum, various vegetables, chairs and tables. 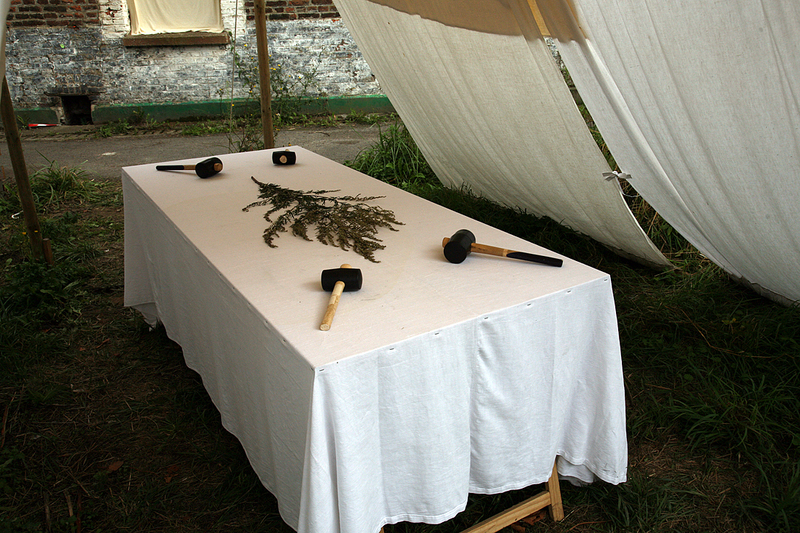 Device: three tents-workshops with tables; from clotheshorse with dyed sheets; of the furniture produced from palettes; a carin transformed into drier of dyed sheets and of papers; a carin drier with plants and of collections of dried plants, of papers and dyed cloths; group of footprints of plants on sheets, stapled on openings of a building. 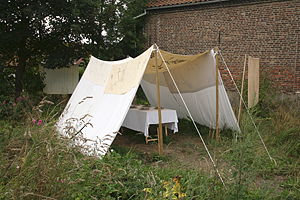 Dimensions of in situ: installations divided in a rectangle about 40 m x 16 m. Height maxi: 2,5 m.
Participations in workshops and in installation of the encampment: Sébastien, Marcel, Frédéric and the technical services of the village; Christine, cultural city service; two groups of Epistème from Bruay-la-Buissière; AMAP «The basket of Mary Groëtte»; garden Sylvain of the «Fields of Ialou» from village of Bours; Michel, ecoguard of Artois Comm. ; Gaëlle, producer of aromatic and curative plants, dryer of the Haute-Planche village of Bourbourg; Steven, journalist; Emilie Schartz, trainee; Clément Bruni and Medhi Hanai assitants. «The premises of this job began with reflexion led in 2011 with François Andès (other guest artist to come to work in this place), then became rich according to accompaniment in the field of Christine Mayeur, to the cultural service of the City of Bruay. I consider this job of the Encampment to be group of forms and of actions worked out in the course of time. These feed on elements found in the site and on people whom I meet there. If the principle of the Encampment registers emergency to invest a place which avoided me (of what's-goes and that is hopelessly tried to save as soon as the City of the electricians becomes a construction site of rehabilitation), pressure made pay attention to a present vegetation around one. The banal became precious, the common became worthy of interest. The job of inventory was born. It is the first form chosen, by circumspection, and to feed my imagination. The idea of a camp, nomadic in its principle, appeared out of necessity, as one " work in progress ", just like a practice of exploration of this abandoned city of the electricians taken as relic. This camp is necessarily progressive and relocatable in its principle. Everything remains precarious, the time of an installation there to explore the site. 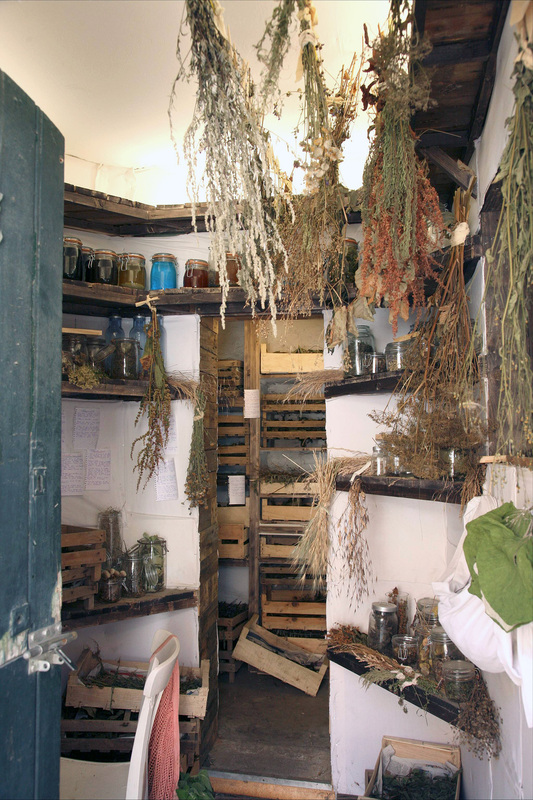 Different investigations lead to create research areas by the manipulation of plant material. 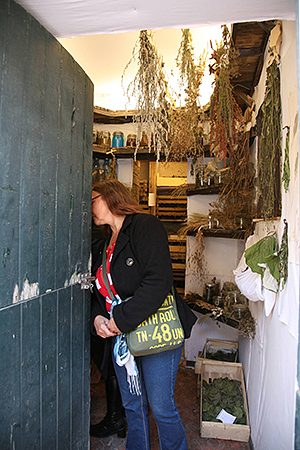 These want to reveal manners and sometimes ancient practices which could release from an ethnobotanique (such curative or culinary applied plant, sometimes transported by populations migrants, then finally left, becomes again a more or less intrusive "wild", as Egopode podagraire). Empirical knowledges a pleasure is born to be made, to practice the vegetable under different aspects. 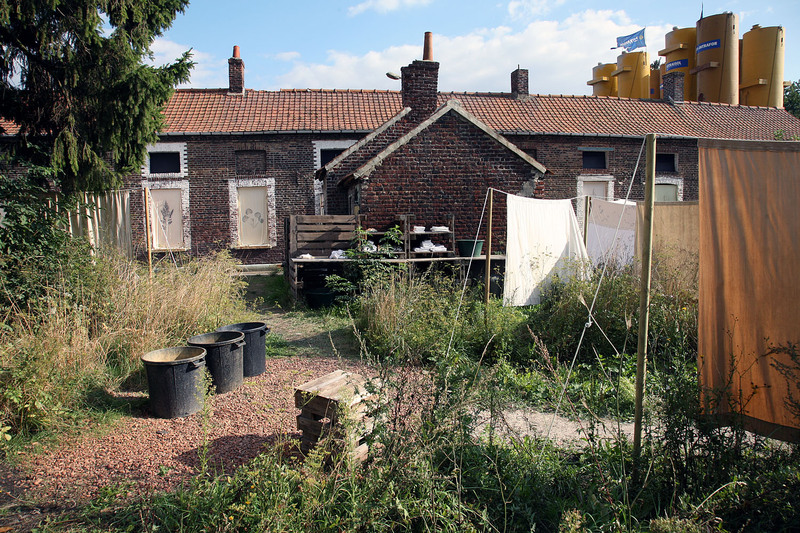 Groups are then invited to become actors who give life to areas used as workshops, in the form of tents born in the principle of this clotheshorse which it was possible to see before in gardens.